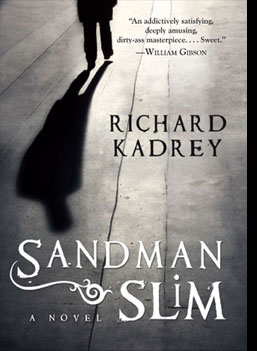 I think Sandman Slim is an awesome work of art that’s being undersold by all the “fun!” and “b-movie” reviews. It is a pulp-trash-western-noir-horror genre mashup of dark and inspired genius. And you do have to be able to bear a hero who is literally “back from Hell” with a demonic talisman and the key to the Room of the 13 Doors embedded in his chest, ready to kill everyone he can. But the thing that makes pulp pulpy, usually, is the cliche and the two-dimensional characterization and plotting. This prose on this book is like a rocketship, inhabiting the cliche hardboiled idea and busting it off into new dimensions (i.e., really no longer cliche). And it’s consistently brilliant and hilarious. While seeming to have created a comic book hero, Kadrey has done more with the characterization, too. It took me to connect with the character because the book is so stylized, but then I started to get into a guy operating on sheer anger and insouciance, despite logic and the circumstances. Maybe it says something about my state of mind that this resonates. The no-way-out situation, the brute-force coping methods, the awareness that the hero himself is at fault feel rich to me. I saw a review somewhere that said ‘adolescent’ but nah, I’m almost 40 and it still feels rich. And the world, in which humanity is shadow-plagued by formless demons who siphon in evil thoughts and evil deeds, as well feels rich and true about the modern world (at least, without quibbling at the actual demons). The plotting is the Achillies Heel. It’s a genre thriller held together by a shoestring-and-paperclip of strained logic without quite the crack-cocaine-suspense skills that it takes to make reading that kind of nonsense engaging. Probably the book’s strength, in terms of sales, is that it’s a simple and accessible commercial genre thriller, but that was my least favorite part. Also, the writer lives in SF and has lots of tattoos and takes fetish photography. Cool! I loved Sandman Slim. It took me a little bit to get into it & the main character but once I did, I didn’t want to put it down. I have the second in the series but haven’t read it yet. I am reading the second one in the series right now, but very slowly….. I kind of just love it on the sentence level and have become unhooked from the plot.